I have used this tool at the restaurant for years. In that environment it is almost indispensable. A "ton" of carrots can be julienned in a flash. Crinkle-cut or waffle-cut potatoes are a snap. Almost any vegetable can easily be transformed into a work of art. Having said that, please understand that this cooking tool may not be for everyone. This tool can be more dangerous than a razor-sharp knife. Most people are aware of the attributes of a knife. Most people are at least somewhat experienced in using a knife. This is usually not the case with a mandolin. The blades for this tool should never become dull or the risk of injury is even greater. What other precautions should be taken? Please read the instructions for the tool you purchase very carefully. Not every mandolin is designed the same way. Each is enough different that you must take care to learn about its operation before "charging" ahead. I prefer stainless steel over plastic even though there are a couple of mostly plastic mandolins on the market that do a good job. Compared with a stainless steel model, they are inexpensive. One that I am familiar with is the Swissmar Borner V-Slicer Plus pictured here. With it you can quickly julienne vegetables and some fruits, shred cabbage and dice potatoes, tomatoes and onions. It comes with three cutting blades. Because it is basically plastic you can expect it to stain and, over time depending on use, wear out. On the other hand, you can't beat the price. The Swissmar Borner Mandoline is one used at the restaurant. The chefs use it every day and really like it. It is a real time saver and can take heavy use. If you cook for crowds regularly consider this one. Remember, please, read the instructions. A "Dial-A-Slice System" allows you to adjust slice thicknesses by pulling and turning a dial to one of several pre-set slice thicknesses. The upper plate of the tool adjusts automatically to produce the selected slice thickness. It comes with a straight blade for slicing. 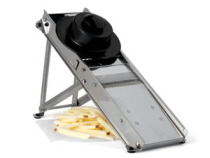 Combined with one of the several julienne blades you can produce vegetable sticks, French fries, shoestring potatoes and the like. The serrated blade is for producing crinkle and waffle cuts. Used with care, a mandoline can add a great deal to your cooking endeavors and enjoyment. And ...since a picture is worth a thousand words, here is a video that shows the basics for using this kitchen tool. And, finally, from "America's Test Kitchen," a video explaining what qualities a good mandoline should have - with a recommendation for one (same as mine :-) ). Thanks for visiting! Please be careful if you purchase a mandolin! See you again, soon.